Don’t you just love that image of the American woman baking up dozens of fruit pies for the family to eat and enjoy throughout the week? It wasn’t an indulgence, it was sustenance. Now we often reserve pie for special occasions, so baking it from scratch takes on a level of complication and expectation that it need not have. This holiday season, don’t let pie crust get the best of you! When the crust cracks, the edges charr and the juices leak, think of the American woman baking up dozens of these a week. Think of your pie as simple, honest food without pretension, something that nourishes the body and warms the soul. Honestly, what could be better than that? 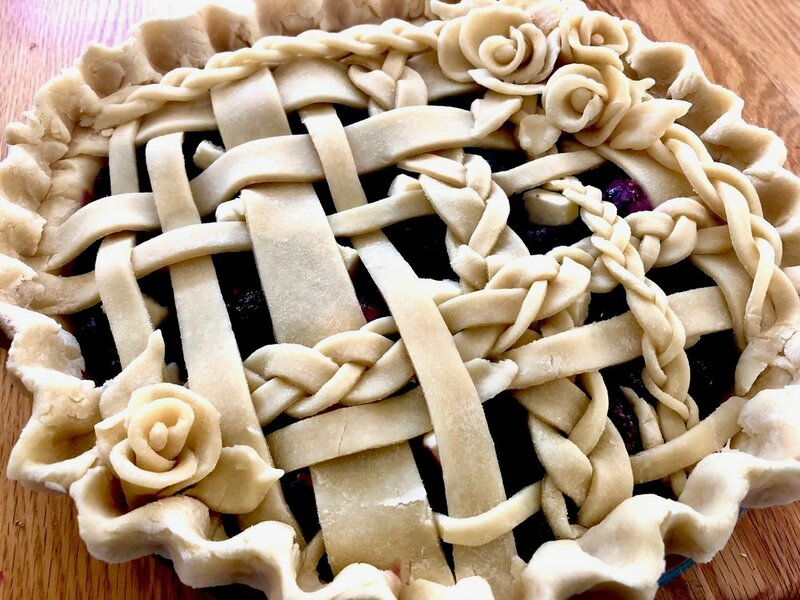 Now, that being said, I have to admit I was inspired by some of the pie art I’ve seen on Pinterest lately, and I wanted to bring some whimsical charm to my usual lattice. My top crust looked oh-so-darling when it was raw, but once it went into the oven, it was out of my control. In the oven, the “real home conditions” the Joy of Cooking talks about took the reigns and turned out a rustic, bubbly, unevenly browned pie that, although far from looking perfect, tasted just right. Below, you’ll find a recipe for a classic blueberry pie with my preferred all-butter crust. Preferred, because it’s a simple ratio I’ve taken to heart and that has served me well in pie after pie. I give the recipe for the blueberry filling using frozen blueberries, because that’s what’s easiest (and often cheapest) to find this time of year. You can easily sub fresh. I mention it below, but just to give you a heads up, if you are working with frozen blueberries, you do not want them to thaw. You’ll want to stir up the filling, dump it in the crust, and bake asap. After the recipe, I walk through a tutorial of sorts on how to go about the whimsical lattice with braids and flowers. You can just as easily do a classic lattice (woven or unwoven) or a solid top crust with air-vents. A simple blueberry-forward recipe, which altogether avoids that gooey gelatinous filling while still holding together in clean slices. A squeeze of lemon juice and hint of zest give the blueberries a refreshing, bright flavor, while the all-butter crust offers a satisfying warmth and depth. *if using salted butter, reduce salt in crust to 1/2 teaspoon. Dump the dough out onto a clean work surface and use your hands to gather it together into a ball. You can take your palm and smoosh the dough against the table to help smear out some of the butter and give the crust a little more flakiness. But don’t work the dough too much—just enough to gather it together. Divide the dough in two pieces, flatten each into a round disk, wrap tightly in plastic wrap, and refrigerate for 1 hour, or up to 2 days. Prepare crusts. Once chilled, take out one pie crust. Let it rest at room temperature for 5 minutes before proceeding. 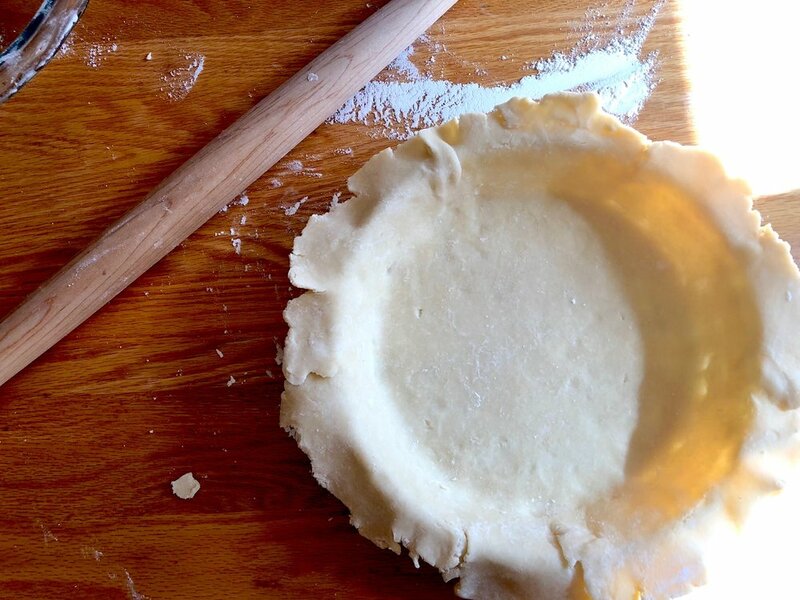 On a generously floured work surface, remove plastic wrap and roll out your pie crust into a roughly 13-inch diameter circle. Gently lift up, wrapping around your rolling pin if needed, and lay out in bottom of a 9-inch pie pan. Press lightly so that it lays flush against the bottom and sides of the pan, and trim the overhanging dough to about 3/4 inch all around. Use scraps to patch any cracks, and save remaining for decorations. Return pie pan to fridge. Pull out the other chilled pie crust. Let rest for 5 minutes, then unwrap and roll out into a roughly 13-inch diameter circle. If using a solid top crust, go forward as usual. If planning to do a lattice or weave, jump down to “making a whimsical braided lattice” tutorial below. Make the blueberry filling and bake. Preheat the oven to 400 degrees. In a large mixing bowl, measure out frozen blueberries [see measuring note], sugar, corn starch, lemon juice, lemon zest and salt. Stir until mixed. Immediately dump the mixture into the prepared bottom crust, spreading out evenly. Dot the top of the crust with the prepared cubes of butter. Lay the top crust on top, trim any excess, press to sea and crimp/flute the edges. Immediately place in oven and bake at 400 degrees for 50 minutes, then reduce the temperature to 350 degrees, place a baking sheet on the rack beneath to catch any overflowing juices, and continue baking for another 25-40 minutes, until the juices are thick and bubbling. (If the crust edges begin to get too dark, you can make an aluminum foil collar to wrap around the edges to shield and slow browning.) Let cool completely before slicing. On measuring frozen blueberries: To measure out the frozen blueberries, you’re going to want to knock as much ice off of them as possible. If they are very icy, with clumps of frozen water/juice, I’ll place in a colander or sieve and shake, letting the ice clumps sink and skimming the blueberries off the top. Because frozen fruit resists settling, the Joy of Cooking recommends measuring out first 4 cups in a 4-cup measure, then the final fifth cup in a 1-cup measure. 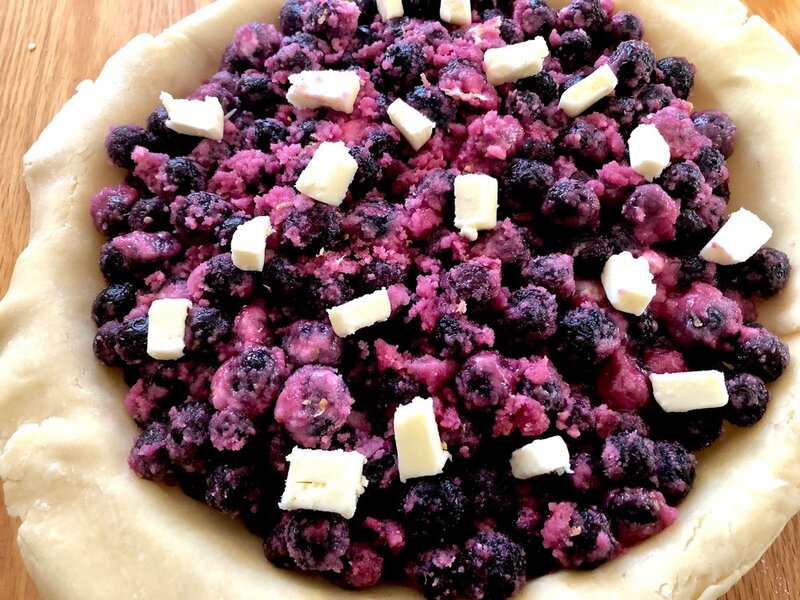 Substituting fresh blueberries: If you plan to substitute fresh blueberries, you’ll want to let the filling sit for 15 minutes before pouring into the prepared bottom crust. Then, you’ll bake at 425 degrees for 30 minutes, reduce the oven to 350 degrees, place baking sheet on the rack beneath to catch any drips, and continue baking for 25-35 minutes, until the juices are thick and bubbling. 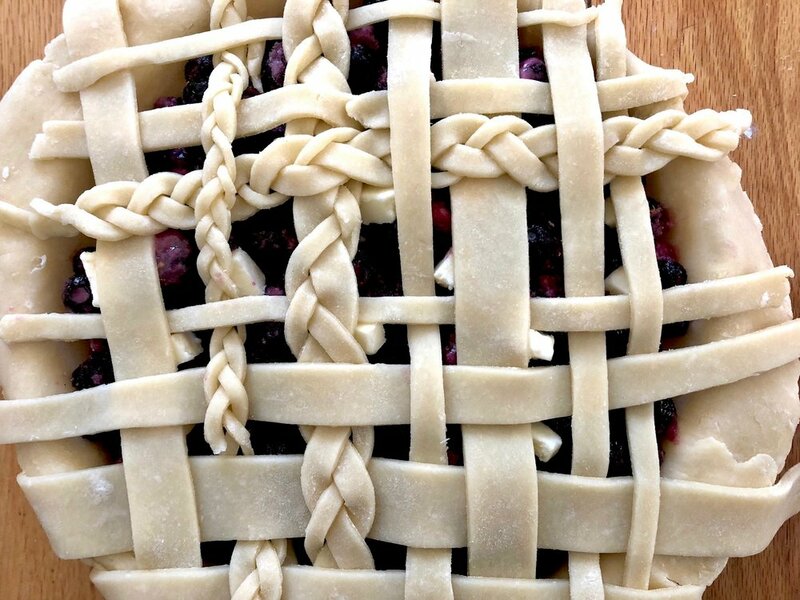 To make a whimsical braided lattice, after you have rolled out the top crust in a large 13-inch round, use a pizza cutter to slice long strips. I did a mix of thicker and thinner strips to give it a more bohemian vibe, and planned to braid together in sets of three some of the thinner strips. Any of the smaller strips on the edges (that would be too small to weave), gather together along with the scraps from trimming the bottom crust, and roll out again. Using a small circle cutter (a piping tip! ), cut out little circles. Shape those to create little rose buds by taking one round and rolling it in on itself with one end slightly tapered. Take another circle and wrap it around. Continue building up petals. Add a small ball of dough at the center if you wish. Use any extra to shape into small leaves. Lay out your prepared strips, braids, flowers and leaves on a baking sheet lined with plastic wrap or parchment paper. 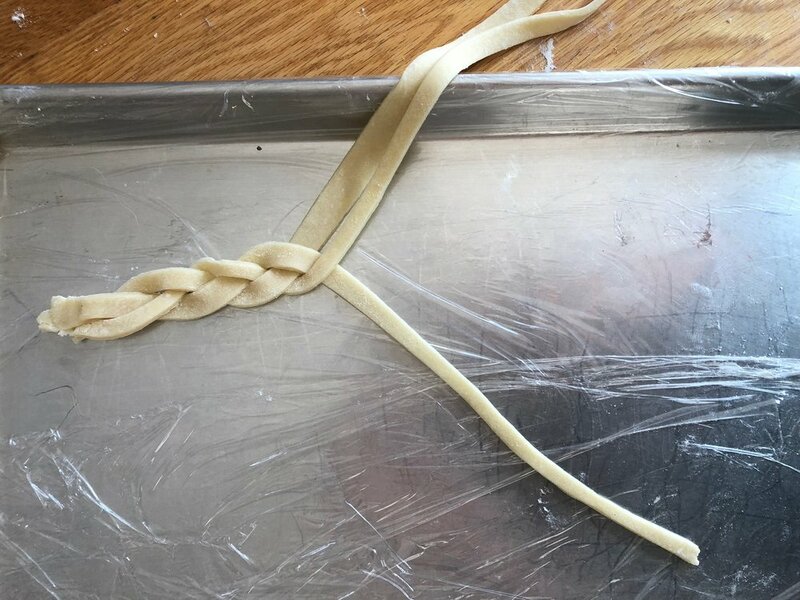 On a large piece of parchment paper, lay out half of your strips, using a mix of widths and braids. One at a time, from the remaining strips, weave them over and under in the opposite direction. (If you wish, leave out a couple braids. These will rest directly on top of the lattice.) Slide the parchment paper with the woven lattice onto a cookie sheet and return it to the fridge to chill until it’s ready to go on top. SORRY I FORGOT TO TAKE A PICTURE HERE! When the pie is ready to go in oven, simply remove from the woven lattice from the fridge and slide it on top (you may find flipping it on top works as well, although a little more risky). Once most of the lattice is on top, you can move around the pieces to straighten them and patch any places where it may have broken. Trim any excess overhang. Crimp the edges of the crust by pressing down on each strip where it meets the bottom crust, then going around and folding the overhang from the bottom crust. If you reserved any extra braids, arrange these on top as you like (I lay them on top to create a sort of anchor for the cluster of rose buds). Arrange any extra braids, flowers and leaves on top. Flute the edges, and bake as directed!